I've got an 04' Accord EX 2.4L, with 160k miles. Im planning on replacing the timing chain /water pump when it warms up some. are there any timing chain sets anyone would recommend to get or to stay away from? Also, I've kept up with all the standard stuff (oil, filters, plugs) since I bought it at 32k miles. The only thing outside of routine maintenance ive had to replace is the starter & thermostat. Is there anything else that I should look into repairing/replacing at this point. The car still runs great, and I'm planning on looking over all the suspension parts when I replace the timing chain. I drive 100 miles Miles round-trip on a daily basis. Why are you replacing the timing chain? If for no other reason than "just because", don't bother; these chains are typically good for the life of the vehicle. But im not so worried about the chain, im more worried about the tensioner than anything, im worried the tenisoner will wear out causing the chain to increase slack causing the engine to be further and further out of time. Now Im also not set on that logic because Im not positive if its the type of tensioner that once you set it, its set in place and can not wear out. Another side of me is thinking I should go ahead and replace the water pump and while im there i might as well replace the timing chain. A check engine light and code P0341 will be set by excess chain slack. 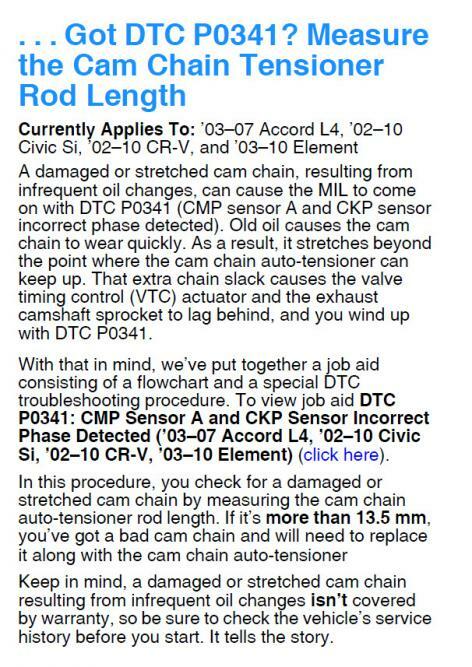 Google "Honda timing chain tensioner" for some interesting reading. I suspect risk of damage/oversight doing such a preventive maintenance task far exceeds risk of closely monitoring engine and good maintenance practice. As TexasHonda says, unless you're getting an error code, not worth mucking about with the timing chain. As for the water pump, as I've seen so many "new" water pumps fail within 10,000 miles, I never-EVER replace a water pump on a timing chain engine unless it is already leaking. Funny thing about factory water pumps, a quarter of a million or more miles is not at all unusual; contrast that with aftermarket units which I don't believe I've ever seen one go even 100,000 miles before failing. Usually the cause of a stretched chain is due to low oil levels or infrequent oil changes. awesome, well thanks alot for the info guys. I think I'm in this same situation but with a P0341 code. Car is running fine and I'm trying to figure out why the code keeps coming up. Everything points to the tensioner and stretched timing chain with my 2005 Accord 2.4L. Car is running fine an I don't want more issues. Quick Reply: 2004 2.4 Timing Chain?